Effortless style without compromise on safety is the hallmark of our less abled collection. When designing your space we will consider practical solutions with design led products, giving you a luxurious, functional, future proof room. Our beautiful wet rooms provide the all in one shower experience giving you easy access, providing a perfect balance of beauty and practicality without compromising your safety. Are you considering changing your bath for a shower? 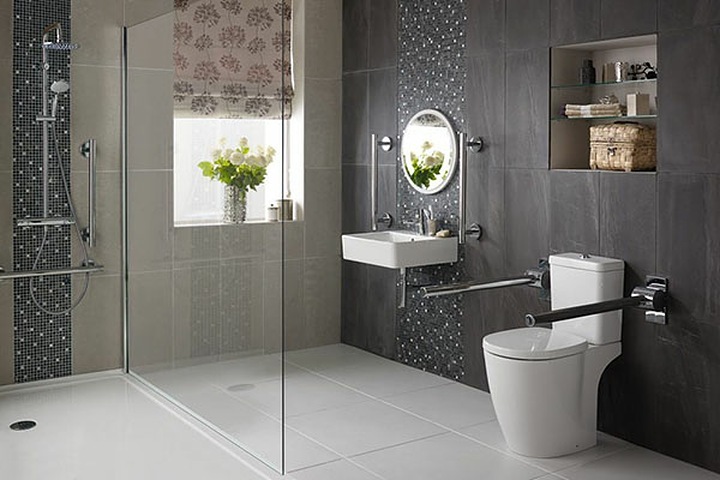 We can design a contemporary wet room look eliminating a step up with the convenience of a low profile shower tray. With multiple sizes and designs available this allows us to provide flexible solutions when replacing your bath. You may decide a bath is still essential, as well as a vast range of shapes and sizes we can also offer specialist easy access baths, with low thresholds, walk in doors and slip resistant base. Good design is no longer reserved for standard height toilets, we have raised toilets which are contemporary and practical. Our range of basins is vast in both design and size. Wall hung basins are also available making it easier to sit at them. Added care solutions such as taps, hand rails and shower seats will all play in important part in how you use your less abled room. We have ample products to make your experience comfortable without compromise on design or finish. KBB Designs are a local independent family run business. We have been transforming homes for almost 37 years and have a commitment to constantly evolve and improve drawing on our vast experience and are in a position of offering unrivalled service and customer satisfaction.